On October 9, Egypt&apos;s military made international headlines: Instead of enabling Copts to peacefully demonstrate the dismantling of a church in Asyut, it joined the riot police in confronting the protesters. 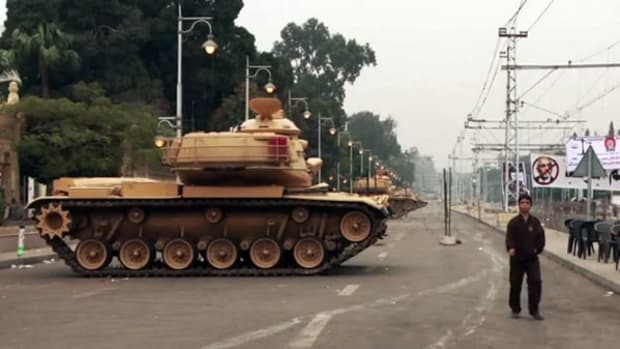 They received support from Egyptians, whom the state media had urged to "protect the army." More than 200 people were wounded, and more than 20 died. The incident led Western observers to question the military&apos;s commitment to political reform. Journalists point to the ever-lengthening timetable for parliamentary and presidential elections, and to the large number of high-speed military trials that move alleged civilian offenders from arrest to sentencing in less than a week. But the wonderment with which Western audiences encounter Egyptian politics is rooted in a misunderstanding of the military&apos;s role in the revolution. It&apos;s well known that President Hosni Mubarak&apos;s ouster empowered the country&apos;s opposition forces. More obscurely, the revolution also empowered the country&apos;s generals. What should the U.S. government do in the face of what may be a slow military power grab? Egypt&apos;s military has been a central part of the country&apos;s political system since 1952, when the Free Officers ousted King Farouk, seized the reins of government, and established a republic. In 1956, Gamar Abdel Nasser won the presidency. He ensured that all important government portfolios were in the hands of military men and allowed the armed forces to engage in civilian production. As a result, they became an integral component of the Egyptian economy. The generals and their subordinates of flag rank commanded respect and privilege. This gave them stakes in maintaining the authoritarian republic. Nasser&apos;s successors were military officers, too: Anwar Sadat came from the Signal Corps, Hosni Mubarak from the Air Force. Under their rule, the public profile of the armed forces diminished. Both Sadat and Mubarak "demilitarized" the cabinet and often appeared in civilian dress. Still, in the background, the generals enjoyed privilege, for they were the ultimate guarantors of political stability. In the mid-2000s, the standing of the military brass was challenged from two directions: On the one side, there were Egypt&apos;s intelligence services, in particular the State Security Service, a brutal version of the FBI, whose domestic power only increased with the war on terror. On the other side was a new globalization-oriented business elite, fostered in the 1990s to provide the government with support during a structural adjustment program, which was administered by the World Bank and entailed unpopular sales of state-owned companies. The members of the globalization elite clustered around President Mubarak&apos;s son Gamal. Over the years, they advanced into key positions within the ruling National Democratic Party and helped groom Gamal for the presidency, in case his aging father should pass away. While President Mubarak had been trained as a bomber pilot, his son was an investment banker with no special bond to the armed forces. Not surprisingly, Field Marshal Muhammad Hussein Tantawi, the commander-in-chief of the country&apos;s armed forces, opposed the idea that the presidency might be inherited by a civilian. Just a month before the revolution, it looked as though the military&apos;s influence was on the wane. 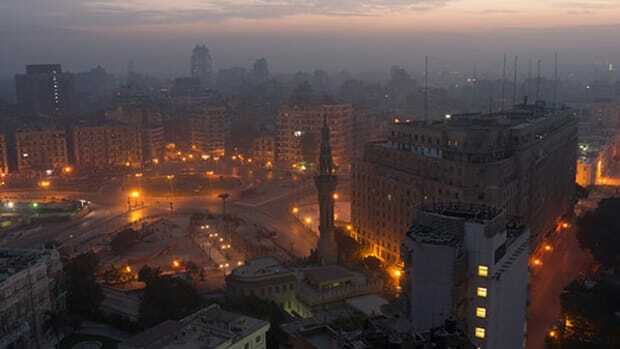 But the January 25 protests changed all that, for they weakened both the Interior Ministry and the State Security Service, destroyed the National Democratic Party&apos;s claim to leadership (the party offices overlooking Tahrir were torched), and saw the arrest of Gamal and his friends on charges of corruption (such as the trial of steel tycoon Ahmed Ezz). 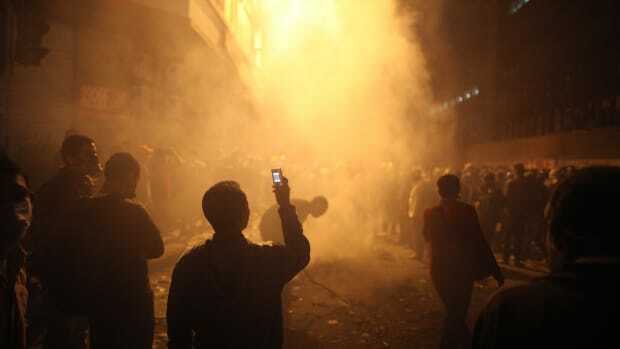 The January 25 revolution, as Egyptians call it, buoyed the hopes of Egypt&apos;s opposition forces. But by eliminating the military&apos;s political rivals, it also played into the hands of the generals. While the protests of October 9 were the deadliest post-Mubarak clash between society and the state, they were not necessarily the most violent. During a two-and-a-half-month research trip to Cairo this summer, I learned this from up close. In late June, the families of the casualties of the January 25 Revolution were at a memorial celebration in the Cairo district of Agouza, where they were attacked by thugs (who, some Egyptian observers believe, were hired by members of the government&apos;s old guard). In response, the families moved to Tahrir Square, where they demanded justice. There they were received by the riot police. Things got violent, and several hundred people — some sources claim as many as 1,000 — were injured. Quite possibly, the generals want to hold on to power and, for that purpose, even fan the flames of sectarianism. In fact, democracy activist Asmaa Mahfouz suspects as much. When I interviewed her in June, she explained that to justify his authoritarian rule, Mubarak depicted the Islamists as villains that had the power to turn Egypt into a theocracy if left to their own devices. Now, she said, Field Marshall Tantawi was doing the same. This raises the question of what the Obama administration should do. Noting that the U.S. government is overcommitted in its foreign policy, "concentrating almost entirely on preventing bad situations from getting worse," professor Jeremi Suri of the University of Texas at Austin recently recommended that the White House focus on maintaining "the credibility of the dollar as the de facto reserve currency of the world; [halting] the proliferation of nuclear, biological and chemical weapons; and [maintaining] peaceful relations with China." All other international commitments, Suri said, should be reduced. In the case of Egypt, this good advice offers no solution. By supporting the country&apos;s military with more than $1 billion per year, the U.S. has made itself a participant in Egyptian affairs, down to the American-manufactured tear gas canisters that the riot police lobbed at the masses during the revolution. Given this close relationship with Field Marshal Tantawi and his colleagues, inactivity by the U.S. government is equivalent to supporting a return to authoritarianism. Like his predecessors, President Obama has painted the U.S. as an ethical superpower. In his inaugural address, he presented himself as a cosmopolitan president, and in his 2009 Cairo University speech, he expressed his desire "to seek a new beginning between the United States and Muslims around the world, one based on mutual interest and mutual respect." The statement made sense on the background of past U.S. Mideast policy. In the 1990s, when President Bill Clinton presided over the Oslo Accords, he won the goodwill of Egyptians because they felt that his government was genuinely concerned about the fate of the Palestinians. The Bush administration squandered most of these reputational gains by waging the Iraq War under false pretenses, tacitly supporting Israel&apos;s monthlong bombing campaign over Lebanon, and opening Guantanamo Bay, which Egyptians with some justification perceive as an extrajudicial torture center for Muslims. Thus far, President Obama has failed to live up to the promise of the ethical superpower. The U.S. continues to occupy Afghanistan and Iraq; Guantanamo is still in operation and unlikely to be closed within the coming years. In September 2011, the White House announced the intention to use its veto power, should the Palestinians apply to the U.N. Security Council for statehood. Thus far, the administration has failed to provide compelling reasons why it plans to do so. It should come as no surprise that Egyptians, like many other residents of the Middle East, have little faith in U.S. policy. Citizens of the Arab world are hard to please. When Libya&apos;s Moammar Gadhafi massacred the opposition, the Arab League called on the U.S. to intervene by enforcing an international no-fly zone. When it did, with fire power, the Arab League turned critical. What sets the present situation apart is its absence of ambiguity. Egyptians want the armed forces to provide order and security, and would like a government that creates employment and provides youth with an outlook for their future. What citizens — Islamist, secular, and in-between — do not want is a military clique that rules the country, enjoys privileged access to society&apos;s resources, and imprisons Egyptians at will. They made that clear in January. To be an ethical patron of the Egyptian Armed Forces, the U.S. government needs to convince the generals that ultimately, they must let go of their power. To win the goodwill of the Egyptian people, Obama should moreover state publicly that the U.S. supports the desire of Egyptians for civilian rule. Hopefully, the Obama Administration understands this.